Having guests come to stay with you offers a great way to spend quality time with those you love most. If your current home isn’t particularly large, however, you might not be able to offer guests a comfortable place to sleep. Keep reading to see how building a guest cottage or small pine cabin on your property could be the solution to this problem. Although it is fun to spend time with your guests throughout the day, there will be times when you both want to enjoy some privacy. Avoid unnecessary stress from spending too much time together by adding a pre-fabricated guest cabin to your property. This way, everyone can have a space of their own. If you want to be a good host, you should take your guest’s comfort into consideration before you invite them to enjoy your home. When your guests can have their own space , it will be easy for them to get situated and feel at home. With their own room, bathroom, and plenty of closet space, they will be able to relax and really enjoy their visit. It is natural to want to invite large numbers of family members and friends to visit. Adding a guest cottage to your property will give you the room you need for all of your entertaining ideas. Whether you want to throw a huge family gathering during the holidays or host a cook out during the summer, a guest cottage will give you the extra space you need. With the cottage packages from Knotty Pine Cabins , you can build your dream home or a guest house. We make pre-fabricated cabins that give you the comfort and style you want in a residence. Call (780) 484-2224 to start planning your guest cottage. You and your family can get away from the stress and worries of modern life and go back to a simpler time by choosing a log cabin from Knotty Pine Cabins. We offer Edmonton’s best selection of wood homes, allowing individuals and families to start making new memories in a not-so-new style of space! If you want to learn more about the history of cabins, watch this short video. As you can see, cabins have played an important role in history, adding to the reputation for durability and tradition that they hold today. 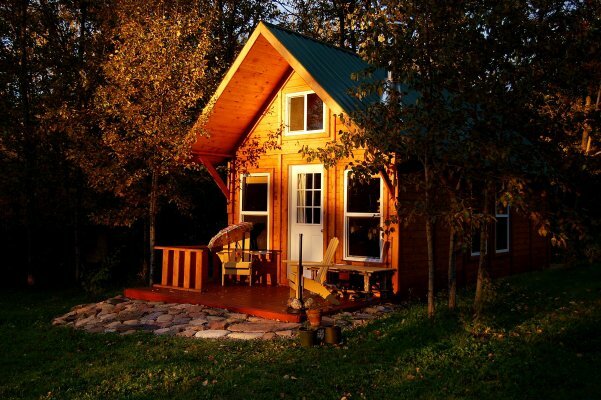 Learn more about the benefits of log cabin living by contacting Knotty Pine Cabins today. Give us a call at (780) 484-2224 or head over to our webpage for more information about our pine homes. When many people think about reducing their impact on the environment, they think about driving less or recycling bottles and cans. In fact, there are many other ways to green your life—starting with your home. Choosing environmentally friendly building materials for your cabin is a great way to start living in a more eco-conscious fashion. Pine and other organic materials are not only better for the environment, but better for your health since they do not emit volatile organic compounds, or VOCs. From your pre-fabricated home in Canada to the cleaning products you use to keep your cottage clean, there are countless ways to reduce your impact on the environment. Check out our infographic for ideas on how to make your home more eco-friendly. Please share to spread the word about conserving energy and resources. Steel and concrete may be strong, but they provide very poor insulation for homes. A process called thermal bridging allows heat to travel through steel, meaning that there is exceptional heat loss in winter. Concrete allows for significant heat loss as well. Wood provides great insulation against heat loss , and as an added bonus, it can easily be adjusted to accommodate more insulation. When determining the energy efficiency of home building materials, heat conductivity is often taken into consideration. A material’s conductivity rating is based on the amount of heat it absorbs. The less heat that a given material conducts, the less energy the house’s utilities must produce to heat or cool the interior. Wood is 400 times less conducive than steel and 8.5 times less conducive than concrete, making it the clear winner in the battle of low conductivity. Building codes for energy efficiency have been making an appearance in more and more municipalities around the world every day. In today’s increasingly eco-minded society, many homeowners and builders are likewise finding that traditional building materials cannot meet those codes as well as wood. The versatile nature of wood means that it can be constructed to match just about any energy efficiency requirement, even in extreme climates. For example, if you live in a climate with extremely cold temperatures—like Alaska and the Canadian Arctic—a double wood-frame wall system can keep your log cabin’s interior warm in temperatures as low as 40 degrees below zero. No other building company in Alberta appreciates the benefits of wooden cabins like Knotty Pine Cabins . Our vast array of pre-fabricated and custom pine cabins ensures that your dream getaway home is never far out of reach. To learn more about our cabins, visit our website or call (780) 484-2224 to speak with a representative. Extra storage space is a must-have for many families looking for a pine home. Some families only need a small amount of storage, while others require more space. When you choose a Knotty Pine Cabins home, you can enhance it with one of our instasheds, available in 16 different sizes. No matter how much you need to store, you can find the shed that is perfect for you! Moving into a new home can be a time-consuming process. If you do not have time to dedicate to building an elaborate shed, you can find the outdoor storage and style you seek with an easy-to-assemble shed kit from Knotty Pine Cabins. Our kits come with all of the hardware needed to assemble the instashed. We also include easy-to-understand instructions that can take you step by step through the building process. No two families are the same, which is why no two homes are the same! If you want a unique shed for your family’s new space, choose custom elements by working with the team here at Knotty Pine Cabins. Our employees can customize certain features of your shed kit, such as the window placement and door placement. Knotty Pine Cabins offers wood homes, instasheds, and much more! Give us a call at (780) 484-2224 if you are interested in finding more information about our pine homes and pre-fabricated cabins.